It’s not surprising that an isolated incident in Benghazi, Libya, took up a significant chunk of the 2nd Presidential debate between Barack Obama and Mitt Romney, while the war in Afghanistan, now in its twelfth year, was ignored. It shouldn’t have been, but although the war is mostly lost, it is even more important to dissect the reasons for that failure, in detail, and it’s a tragedy that American voters aren’t demanding that the political class be held accountable for it. Since 2009 polls show that Americans have turned sharply against the war, with two-thirds to three-fourths of respondents opining that war isn’t worth fighting. Although the war has long been considered unwinnable by many foreign policy experts, American voters now seem to have reached the same conclusion. President Obama’s decision to wind down the war by next year, and to withdraw all U.S. forces in 2014, isn’t controversial. But 2,000 Americans, and tens of thousands of Afghans, are dead – yet that war-battered country is arguably no closer to peace and stability than it was at the end of 2001, weeks after the U.S. invasion. In the past, Romney has expressed some important differences with the president on Afghanistan. He’s said that he’d never talk to or negotiate with the Taliban, and he’s criticized Obama for drawing down too quickly the 30,000-plus troops that were deployed in the 2009 “surge” that Obama ordered. During the Republican primary season, Romney said repeatedly that he’d reconsider withdrawing U.S. forces depending on conditions on the ground, and on the advice of the generals. 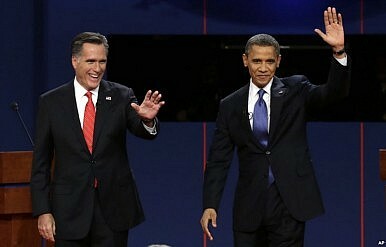 The next Obama-Romney debate will be held on Monday, and it is supposed to focus on foreign policy and national security. Questions framed around the arguments in the Times editorial, the ICRC’s comments, and the ICG report might elicit useful responses from both candidates. But don’t expect serious discussion and debate. As in Iraq, where President Obama closed the door on a horrific mess created by his predecessor without seeking to hold the administration of George W. Bush accountable, in Afghanistan too the president seems willing to declare victory – that is, the killing of Osama bin Laden – and come home. And while Romney may make a mention or two of the fact that the Taliban isn’t going away, neither candidate should be expected to answer the hard questions left over from America’s longest war. Those questions include both tactical and strategic ones. The tactical ones are: Since the United States is leaving, what are your thoughts about how to assemble a rebalanced Afghan government that includes all elements of society, including the insurgents? What can we do about Pakistan, which continues to harbor, support and encourage the Taliban and its allies, including the Haqqani group and Gulbuddin Hekmatyar’s organization? And what steps will you take to bring Russia, China and Iran to an agreement with the United States and Pakistan to reduce political conflict among their allies in Afghanistan? The strategic ones, however, are more troubling: What have we learned about America’s ability to engage in counterinsurgency and nation-building in countries like Afghanistan? What does America’s failure in Afghanistan say about its ability to take action in countries as diverse as Somalia, Yemen, Sudan, Syria, and Iran? If you claim that the United States is “exceptional,” and that American “exceptionalism” still prevails, are you deterred by our exceptional failure in twelve years of war in Afghanistan? Attacks on coalition troops by members of Afghan security forces endanger partnering programs and point to grave cultural misunderstandings. US and Japanese search efforts are reportedly closing in on the wreckage of a crashed Japanese F-35A fighter jet.